Anorexia nervosa, a psychiatric disease predominantly affecting women, is characterized by self-induced starvation and a resultant low-weight state. During starvation, a number of hormonal adaptations—including hypothalamic amenorrhea and growth hormone resistance—allow for decreased energy expenditure during periods of decreased nutrient intake, but these very same adaptations also contribute to the medical complications associated with chronic starvation, including low bone mass. Almost 90% of women with anorexia nervosa have bone mineral density (BMD) values more than one-standard deviation below the mean of healthy women at peak bone mineral density, and this disease is associated with a significantly increased risk of fracture. Although multiple therapies have been studied for the treatment of low bone mass in anorexia nervosa, there are currently no approved therapies and few promising long-term therapeutic options. 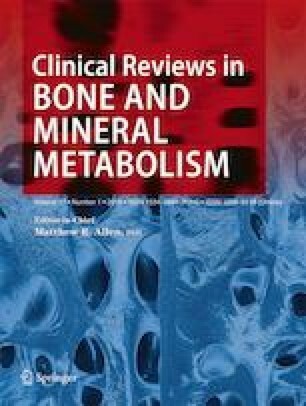 This review will outline the mediators of low bone mass in anorexia nervosa, discuss therapies that have been studied for the treatment of low BMD in this disorder, and highlight the important challenges that remain, including the differences in bone modeling in adolescents with anorexia nervosa as compared to adults, necessitating that potential therapies be tested in these two populations separately, and the paucity of long-term therapeutic strategies for treating bone loss in this disorder. This project was supported by NIH grant R03 DK106410. The content is solely the responsibility of the authors and does not necessarily represent the official views of the National Institutes of Health. This project was supported by NIH grant R03 DK106410. Nagata JM, Carlson JL, Golden NH, Murray SB, Long J, Leonard MB, et al. Associations between exercise, bone mineral density, and body composition in adolescents with anorexia nervosa. Eat Weight Disord. 2018. https://doi.org/10.1007/s40519-018-0521-2. Fazeli PK, Faje A, Bredella MA, Polineni S, Russell S, Resulaj M, et al. Changes in marrow adipose tissue with short-term changes in weight in premenopausal women with anorexia nervosa. Eur J Endocrinol. 2018. https://doi.org/10.1530/EJE-18-0824. Maimoun L, Guillaume S, Lefebvre P, Philibert P, Bertet H, Picot MC, et al. Role of sclerostin and Dickkopf-1 in the dramatic alteration in bone mass acquisition in adolescents and young women with recent anorexia nervosa. J Clin Endocrinol Metab. 2014:jc20132565. https://doi.org/10.1210/jc.2013-2565. Fazeli PK, Wang IS, Miller KK, Herzog DB, Misra M, Lee H, et al. Teriparatide increases bone formation and bone mineral density in adult women with anorexia nervosa. J Clin Endocrinol Metab. 2014:jc20134105. https://doi.org/10.1210/jc.2013-4105.